Grow among other plants. It can be sown directly in the garden, but usually it is cultivated from seedlings. Sow a few plants several times. It can grow successfully when temperatures reach 10 °C (50 °F) during the day and 5 °C (41 °F) during the night. 30 cm (12 in) between rows and at least 20 cm (8 in) between plants in a row. It can also be planted among other crops that go well with it. Approx. 10 plants per person. February-mid August for seedlings. It germinates in 10 days. With home compost. Grow in the second field. Be careful about the lack of boron. It needs less fertilization when grown among beans or peas. It is sensitive to the lack of water, so water regularly to 20 cm (8 in) deep. Legumes, lettuce, beetroot, cucumbers, celery, onions, black salsify, potato, Swiss chard, pepper, radish, asparagus, mint, thyme, chamomile, cumin. It is not very sensitive. If attacked, use the same methods as with cabbage. Pick the swollen stems when they reach approx. 5 cm (2 in) thick, or earlier in summer, as they lignify later. Store them in plastic bags up to three weeks in the fridge. They last up to three months in a moist and cool basement. Use young, meaty swollen stem and leaves (like leafy greens, for juices and in different dishes). It contains the majority of vitamins and minerals. It doesn’t grow well in acidic soil. If it lacks moisture, the tubers burst. 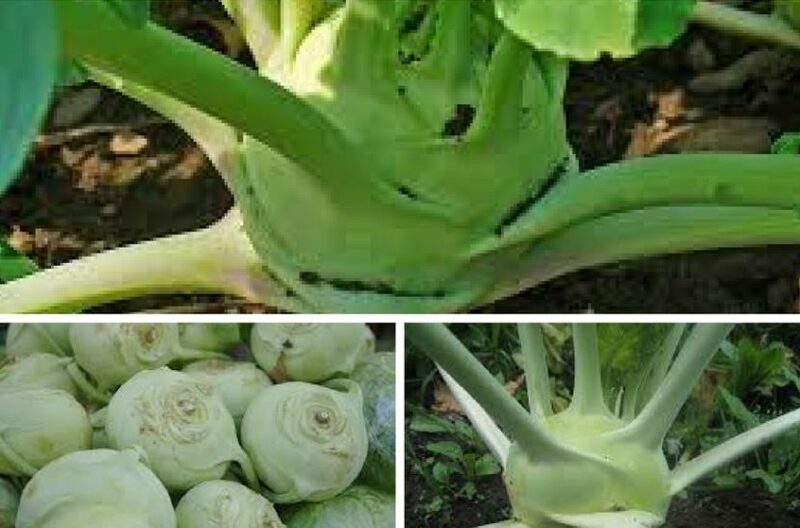 It is also called German turnip or turnip cabbage, because its swollen stem resembles a turnip, but it shouldn’t be confused with rutabaga (Swedish/yellow turnip). There are white and red varieties. The red ones are less sensitive and contain some more beneficial substances.